This Daily Doodle represents the medical uses of the powerful neurotoxin produced by Clostridium botulinum and it also serves as a review of the intricate anatomy of the facial muscles. Clostridium botulinum is a obligate anaerobe, spore-forming, gram-positive, rod-shaped bacteria that produces eight types of toxins, lettered A to H. The botulinum toxins, BTX-A and B, are available commercially for various cosmetic and medical procedures. The botulinum toxin is well known for its potentially life-threatening paralytic condition after consuming improperly preserved food containing the toxin. Thankfully, botulism poisoning is rare in Canada with only about two cases per year (3). But, with that said, always think twice about eating questionable canned food and error on the side of caution. For further information, Health Canada has provided a list of precautions to reduce the risk of BTX poisoning. The mechanism of action of BTX is featured in the top right corner of this Daily Doodle. BTX prevents muscular contraction by blocking the release of acetylcholine from peripheral nerve cells into the neuromuscular junctions. Understanding the mechanism of action of BTX has allowed researchers and clinicians to discover new uses and clinical applications. See below for a comprehensive list of clinical uses of BTX. The botulinum toxin is also well known for its use for cosmetic indications, which was first reported and published by a Canadian husband and wife team, Drs. Carruther (dermatologist and ophthalmologist) in 1992. The use of BTX-A for cosmetic indications requires an in-depth understanding of the facial anatomy including the origin and insertion of the muscles, their vector of pull and the common anatomical variations. 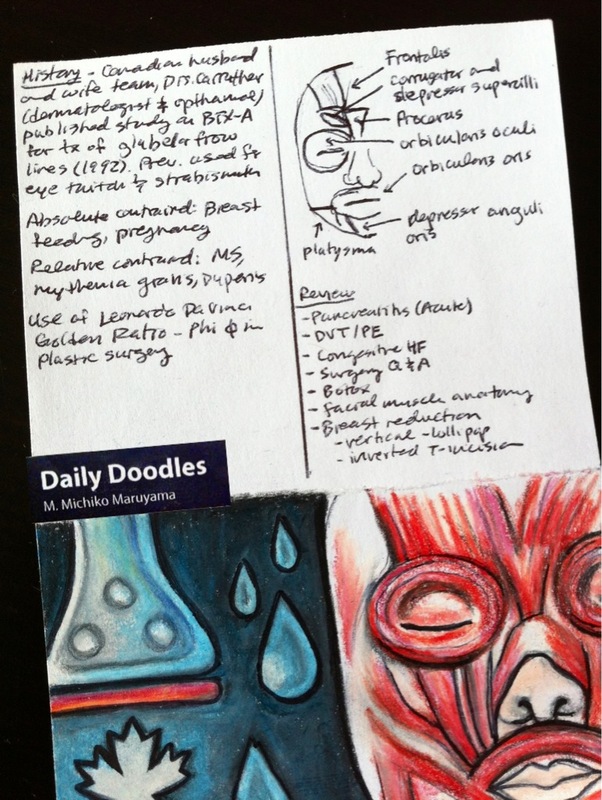 This Daily Doodle captures a few of the major facial muscles that can be treated using BTX. The multiple drops in this Daily Doodle represent the multiple clinical uses of BTX, in particular hyperhidrosis (increased perspiration/sweating), and the Maple Leaf is to symbolize the contributions of the Canadian Team Drs. Carruther and their published findings.